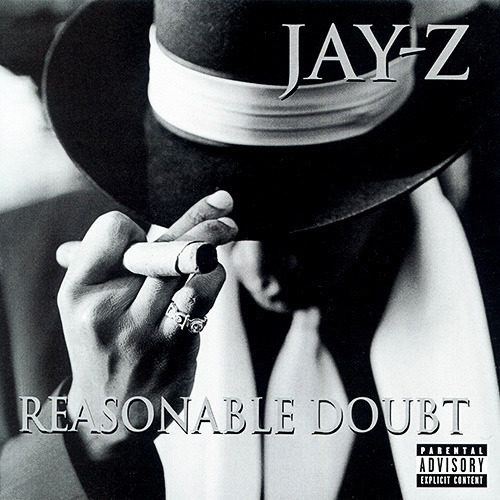 On Thursdays we review albums that are considered “classic” and today we review Hov’s classic LP Reasonable Doubt. Embracing the East-coast mafioso style with enough 1990’s New York street vernacular to fill a concert hall with, Jay Z started his monumental career with his crowning achievement, Reasonable Doubt. Today, Jay Z is involved with such a multitude of business ventures that his music has started to fall victim to the stresses and pressures of pop culture. This was not at all the case of his early work, which was rooted in Jay’s struggle to make a name for himself. Now-a-days Jay Z touches a track and the internet crashes, regardless of its quality. The man has nothing left to prove to anyone, yet he still makes music which is admirable. The problem is that it is nowhere near the caliber of Reasonable Doubt. There was a definitive passion in the way Jay Z rhymed that forced you to pay attention. He commanded each song with the finesse of a veteran. The 15 track album opened with the answer to a question that anyone had yet to ask. Can you knock Jay Z’s hustle? No, no you can not. With ‘Can’t Knock The Hustle’, Jay starts the album off in his element. He describes his hustler lifestyle in such a way that, even the hardest working, straight-edged businessman has to respect his grind. His flow and delivery is so effortless and confident that it makes rapping seem easy; but much like his depiction of life in the Projects, it isn’t. Plus, what better way to cap off an introductory track on your first album than with Mary J. Blige on the chorus? Jay Z was able to find his niche and settle in for the remainder of the album without letting his ‘hustler documentary’ become diluted to the point of sameness. His metaphors and rhyme schemes were so engaging that you never quite knew where he was going next. Consistently reassuring listeners of the amount of money he could make through various outlets, Jay Z was able to make his harsh life seem desirable. He held an almost hateful reverence for the lifestyle he lived because he saw the negative impact drugs and violence had on himself and his community. The song, ‘D’evils’, gave Jay Z some solace in his acknowledgement of the negative aspects of that particular life. The songs’ genius lies in DJ Premier’s production, which ironically sampled a gospel tune for a song about devilish temptations. The next track may be the album’s most admirable cut, featuring vicious wordplay and a message delivered with incredible subtlety. The first verse of ‘22 Two’s’, speaks on all the things that distract Jay Z from acquiring his much sought after currency; and it does so with the use of the word “To”, in all its variations (to, too, two), twenty-two times. After guiding listeners through the ups and downs of being a hustler, Jay Z hits us with a self-fulfilling question of his own. ‘Can I Live’ is the definition of an East-coast, funky jazz beat coupled with impactful delivery from a Jay Z who is always looking over his shoulder. His money and impending fame make him feel vulnerable in a community rooted in such a deep level of poverty. This song contains some of the most passionately delivered bars I have ever heard. With each line, it’s as if you can hear Jay Z fighting to break the metaphorical shackles his poverty stricken neighborhood has placed on his journey to material and intellectual success. Eventually, Jay Z takes an mentors’ perspective and takes notice of the youth in his hood who look up to him, hungering for a similar lifestyle. He continues through the hustler mentality with songs like ‘Cashmere Thoughts’ and ‘Bring It On’ where he outlines his monetary goals and how he plans on achieving them. The beauty of the album lies in its intricate diversity. Intricate because the subject matter of the album doesn’t vary all too much, yet Jay Z’s delivery is various and consistent enough to keep it fresh and relatable. The irony of the album title is that it was meant to convey the judgments people place on others as well as their creations; and it turns out, very few people are judging this album as anything less than a classic.